The microAIR 50 series mattresses include a series of mattresses to redistribute pressure while offering comfort and stability. 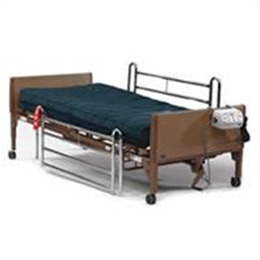 The series consists of a full featured alternating pressure overlay, an alternating pressure mattress system and alternating pressure with on demand low air loss mattress system. The innovative features on the control units for the MA50, MA51 and MA55 provide patient benefit and caregiver satisfaction. This 6" full featured overlay is to be placed overtop an existing mattress. A low cost, effective way to alleviate pressure and aid in the prevention and treatment of pressure ulcers. The MA51 is designed to reduce interface pressure for the prevention and healing of pressure ulcers and sores. The internal cells alternatively inflate and deflate to constantly change pressure points and promote circulation. The MA50 and MA51 share the same power unit with unique features for support and comfort. The MA55 includes all of the features of the MA51 alternating pressure mattress in addition to on demand low air loss. On demand low air loss can be activated with a push of a button. When activated, air is sent inside the mattress to keep the mattress environment cooler for the patient, as well as help with moisture management.